A few days ago a friend and I went to try the new Crepes place in town. I was going to compare it with another new venue, one sporting a sign in front that read "Crapes". This had the makings of a really hilarious post, or so I thought. Things are not always what you expect. Which is what comes of making judgments based upon appearances. Or, what appears while driving past and trying to check out a new restaurant, without getting into an accident in the process. The above pictured cafe served us a lovely salad and our selection of some tasty Greek crepes, an hour after we ordered. Yes, one HOUR. 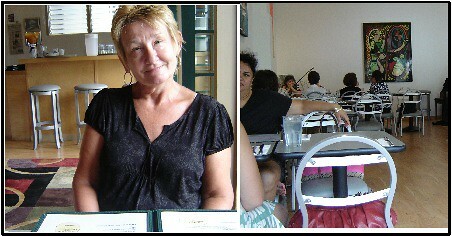 There was a charming musician in a very short, flouncy skirt who donned an apron and assisted in waiting tables. Still, we waited. Everyone was mostly waiting, and waiting and waiting. A few drinks might have helped. I believe the chef was missing her sous chef. Still. 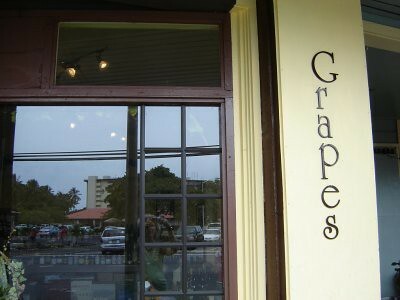 Then, when my daughter and I went to the other "Crapes" place, we discovered it was supposed to be read "Grapes". Hey, a wine shop. Nothing to do with dice. The proprietor stocks what seems to be an eclectic selection of his personal favorites. I bought a bottle of an excellent Washington State Chardonnay and one Spanish red, which I haven't tried yet. No crepes. Maybe the "G" should be made clearer on the sign. Or my contact prescription checked. I neglected to get a picture, which fault will be remedied tomorrow. Then you can judge. Here it is. I guess if you're not whizzing by, thinking of crepes, it could look like Grapes. Your eyes aren't failing you, I did change the title and address of my blog. When I get around to it I may even change the photo at the top. Since I've had an abundance of arugula lately, even after asking the neighbors to come and pick some, I had the (it turned out not so uniquely) brilliant idea of making Arugula Pesto. 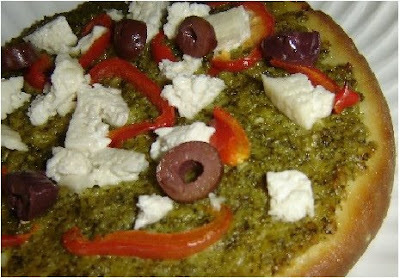 Checking the interweb for recipes, and coming across Susan's exhaustive post on Arugula Pesto, including her use of it on Pizza, I thought "Bingo", my answer! A few friends came over for lunch yesterday, and that's what we had, plus Nancy brought Lillikoi chiffon pie for dessert. Which was excellent, I might add. Seeing as the arugula and some basil I tossed in, came from our garden, this will be my post for the July round of GYO (Grow Your Own), hosted by Amy of Playing House. I also topped the pizzas with crumbled feta, which had been brining 4 weeks. So, this marked its debut. I confess to using some 7" frozen, gluten free, pizza crusts. Is that totally cheating? Anyway, I did make the feta and the arugula pesto myself, so there. Put all 4 crusts onto a pizza oven rack and spread on the pesto, then topped with slivers of red bell pepper, a beautiful contrast to the green arugula. They baked 15 minutes at 375F and then were topped with crumbles of rinsed feta and slices of Kalamata olives. I didn't even get the gluten free on purpose. Just grabbed pizza crusts, without looking closely, on a run past the frozen section. Though, being in a natural foods store, i should have known. But, they were surprisingly (for me anyway) good, very light with a slightly nutty flavor. We all loved them. The Feta was nearly perfect also. A little holey, kind of a Swiss Feta? As I mentioned in that earlier post, it could probably stand with a firmer pressing. Which will also be fabulous stirred into some Pasta. In which case, we'll be calling it Arugula Pesto Pasta. You guessed correctly. Put everything into the container of your Food Processor and whirl, while drizzling in the olive oil. Add the salt after, to taste. I was recently inspired by a post on someone's blog, I now forget exactly where, about Meatless Mondays. Though this idea may be fairly new to me and Paul McCartney, others have apparently done posts on the subject for some time now, including Allie who was posting "Meat-Free Monday" recipes quite regularly - every Monday, from Feb. in '08 until this past March. Not to mention, Catholics were meat-free, one day of the week for about a thousand years, until the Pope put a stop to it in recent history. It was fish on Fridays throughout my entire deprived childhood. There is actually a move by some Catholics to revive this ban. So, due to various considerations, "Global Warming" not being one of them, I've decided it might be a good time to do both - Meatless Mondays and Fishy Fridays. It would help with meal planning, stretch our food budget, promote awareness of those less fortunate (I at least have a tendency toward self-indulgence), be good for health reasons, and encourage creativity in cooking, among other logical benefits that I'm sure are out there. To start things off, for our Meat-Free Monday(yesterday), I did some tofu experiments. I'm trying to come up with a recipe for the Cook the Books Club August deadline anyway, which for this segment is based on The Last Chinese Chef, by Nicole Mones. There is a particularly intriguing dish described in the book, which involves boiling tofu to make it spongelike. A bit of research revealed that freezing will produce the same effect, after which, the little tofu sponges soak up whatever wonderful sauce you simmer them in. With that in mind, I cut my brick of tofu in half, then each half into thick slices. One half I quick froze, the other half of slices I boiled. Then, for the sauce base, I made a mushroom broth, using fresh shitake mushrooms, a variety of dried mushrooms, carrot, celery stalk, sprigs of thyme, bay leaf, salt & pepper. After simmering 45 minutes, the stock was strained, reduced over high heat to about 1/3 of the original volume, then thickened with cornstarch blended into a bit of white wine, a tablespoon of shoyu, and some sweet chili sauce. Both types of tofu were simmered in this for about 5 minutes. Steamed green beans were added to the dish at the end and then topped with chopped green onions. Though quite good, the recipe is not yet perfected. Next time we'll be pressing the tofu under a weight before freezing or boiling. Bob liked the boiled one better and I liked the frozen one, but both could have been more "sponge-like" with less water in them. The road was straight downhill from here. And, I do mean down. Four-wheel drive is required and absolutely necessary. The grand-kids (believe me a first for them) and I were all screaming at Bob to "Slow Down", as he's laughing. This is the way to Waipio Valley, scene of that wedding I mentioned a few weeks ago. I said I'd post a photo, but decided to do a post of photos instead. It was just so lovely. In fact it was so nice, even these wild horses came. Parents, this is the way to have your kids marry. No expensive hotel space to rent, catered meals, or troop of musicians for hire, absolutely no costs whatever. Well, hardly. Planned potluck food. Outdoors in a beautiful setting. I love it. Not the road getting there particularly, but once arrived, it was terrific. Old friends, some good food, Prosecco and Tangerine Wine (made by yours truly) swimming, kayaking in Waipio river which empties into the sea here, surfing even. None of which athletic things I did. I sat and ate and talked and enjoyed the view though. The Family of the Bride, were visiting from Canada. There was actually a wedding as well. We convinced him to put a shirt on first. and Bob joined in on pipe and harmonica. Unfortunately, I must have been too busy eating to get any pictures of the food. Fresh caught grilled fish, bbq'd beef, wonderful salads, two delicious cakes (none of your commercial wedding cake here) and other stuff, which I'm forgetting at this remove in time. Lettuce get rid of all that bolting lettuce, in soup?? I was convinced by Amy at We are never full to try lettuce soup. She shared her grandmother's recipe for cold Butter Lettuce Soup, and of course, not having any Butter lettuce, but several small heads of heat crazy, bolting Savoy, I thought what the heck, we'll try that. Adding in some Tatsoi leaves for their lovely, deep green, along with the chives, and a single radish for garnish. What serendipity, I had it all! Besides awesome color, and a positive spin on the sad end of my lettuce, this soup was cool, refreshing and quite delicious, if I do say so. Flavorful, with a slight tangy, bitterness, reminiscent of endive, nicely offset by the potato and cream. Bob, who would rather do without lettuce altogether, liked it a lot. Especially as he knew a beef tenderloin steak was immediately following. Well, since the lettuce, tatsoi and chives came from our garden, this will be my July 15 entry for the Grow Your Own event, hosted by Andrea this time. First of all I went out with my cute little basket and gathered the produce. 1. Bring water to boil in a medium saucepan, meanwhile preparing an ice bath by putting ice cubes and cold water into a large bowl. Chop bottoms off the lettuces and immerse leaves in the boiling water for thirty seconds. With tongs, remove all greens from the boiling water and “shock” them in the ice water to keep their color. After cooling in the ice water, remove and allow to drain and dry on a towel. 2. Meanwhile, in the olive oil (or butter), sauté your diced onion until translucent. After three minutes or so, add the boiled potato and stir. Add a pinch of salt and about half the chives, stirring again. After a minute or so, add the sherry or wine and allow to cook down (about one minute). When the alcohol has cooked off, add broth and stir. Toss in the rest of the chives and allow to cook for 30 seconds then shut off burner. 3. Remove pan from stove and pour into blender, adding half the cream or buttermilk, along with the cooled and drained greens (removed from any stocks), and puree. Add the final bit of buttermilk, and blend one more time. Taste for seasoning & add more salt if necessary. 4. Refrigerate until well chilled. 5. Serve in bowls with some chopped chives and sliced radish. If desired, swirl in some thinned sour cream, buttermilk or regular cream. For a lighter taste, I decided not to go with any extra cream, and it was great. A perfect summertime change from salad. These are what we call Mountain Apples here. There is a tree in the back of our office property. The fruit is fresh and juicy, texture sort of like strawberry or pear. They don't keep at all well though, so either a juice, drunk up rather soon or, yes, they're calling me ........ wine. 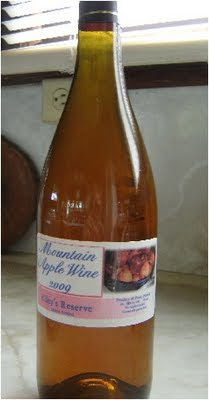 Mountain Apple Wine. And, it should be a lovely rose in color. This will be my first use of this particular fruit for winemaking. Almost every year I make at least one batch of Lemon Mead (since our tree is prolific), and which is absolutely wonderful, as well as a few batches of whatever fruit is in abundance on our bits of land. So far, pineapple, tangerine, guava, jaboticaba, cashew apple, banana and starfruit (carambola), some in blends. To give you an idea of how fast these mountain apples were going to the worms, I prepared (cut up and removed seed from) that bowl full and put them in the freezer. The second batch, I thought could wait until tomorrow, and ripen a bit more. However, next day, cutting those open revealed lots of worm inroads. Had to toss a lot out. I ended up with 6 lbs. worth though, which will make a large jug of wine, or 4.5 liters, (500cl.). A little over a gallon anyway. So, I then added 3 lbs. sugar and one of honey, dissolved in boiling water, to the mashed fruit, as well as the juice and zest of one lemon, some peppercorns, bruised, with 3 allspice leaves, and we were good to go. Right into a primary fermenter, with an air lock on top, where it will stay for a few weeks, until the sugar is down to 3-4%. We are converting the sugars to alcohol here. Use of a hydrometer is highly recommended. Doing an acid test is good. Also, reading Terry Garey's excellent book, The Joy of Home Winemaking, without which, or something comparable, this process probably shouldn't be attempted. In the top right photo you can see a net bag containing the fruit, and the pretty rose colored future wine in the white bucket. I just got myself an industrial sized potato masher from a restaurant supply store, which works great for mashing fruit. After 24 hours in the fermentation bucket, wine yeast is sprinkled on top. If the weather is cold, you may want to give it a head start by putting the yeast in a jar with some honey or sugar and warm water until it is bubbling nicely, and then add it. This is a process that teaches patience. The must (what it's called in the primary fermenter) must be transferred to a glass carboy (large jug), also with an air lock, after removing the net bag of nasty looking (by now) fruit. Do slap on a label. A few months down the road you will notice sediment collecting at the bottom of the jug. Dead yeasts. This is a sign you need to rack (not torture) your wine. Siphon it off into another (always scrupulously clean) carboy. This might have to be done 3 or more times in the coming months. My Starfruit Wine is notoriously hard to clear. The Lemon Mead hardly needs more than one racking. After a year or so you can try it out. At that point you may want to leave it age a bit more. 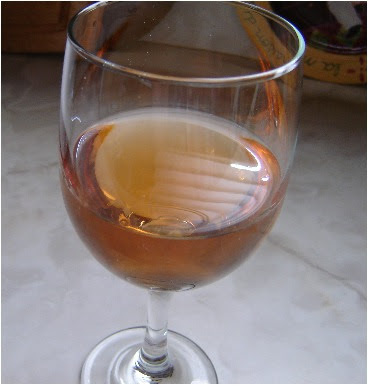 I have found that meads (I call it mead if the sole sugar added is honey) take longer - at least two years for best flavor. Honey gives the wine more character and depth though, so it's worth it in many cases. I take lots of notes in my little wine journal, for future reference. Also highly recommended. Store your fermenting jugs in a dark, cool place. Later you can have the fun of creating cute (or serious) labels after you bottle, even adding heat shrink caps over the lids or corks to be extra fancy. 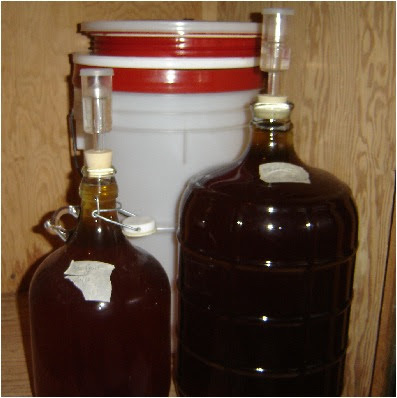 Since I have occasionally read winemaking posts which leave me in suspense as to results, I have added a few comments here on how that Mountain Apple Wine turned out, while there are a few bottles left. Also, please remember this post was not meant to be definitive on winemaking. It takes a good book, like the one I mentioned above, for that. So, light, dry, with lovely floral and herbal notes. Wonderful, if I do say so. It's not as rose colored as in the beginning, now at a more golden blush. This cheese-making business all started with Isaiah going off to Boy Scout Camp for a week. So, his mother didn't want to take her usual gallon of goat milk. I told the goat guy that I'd like a gallon as I've been wanting to try making Feta cheese. This was my entertainment last week. Turning a large jug of goat's milk into 2 containers of Feta and a little tub of ricotta from the whey. Truly, I enjoyed the whole process. Felt very holeistic. Just so you know, that's sort of like holy these days. Here you see more whey draining off the curds and a tub of collected whey on the side. I found directions, after searching the interweb, at this wiki site. This seemed the easiest and clearest recipe, with photos. After the cheese is done, you cut it up in large chunks and put in a salt brine to ripen for four weeks. I have a sneaking feeling that it could have been pressed firmer. I really really need a cheese press. Finally, you can make ricotta out of all that whey you've saved. This is the curds draining after the whey has been brought up to 200F. As a great big added addendum, I've added the recipe in full for this ricotta. Let the whey from your first cheese-making effort sit out covered at room temperature for between 12 and 24 hours to let the acid content of the whey increase. Heat the whey in the saucepan to 200 degrees Fahrenheit. Tiny white curds should form in the whey. If the curds are not forming, add a splash of vinegar. Strain the whey through a cheesecloth made with very, very fine material. If you do not have a fine cheesecloth (also called muslin), use a pillow case or another piece of clean cotton material. You’ll have an easier time straining the cheese if you line a colander with cheesecloth or another material. Let the ricotta drain into a bowl under the colander for about two hours or until no more liquid escapes the cheesecloth. Put the ricotta into a bowl, and salt lightly (¼ teaspoon salt), mixing thoroughly. Use immediately, or store in refrigerator for up to a week. The ricotta was good. It tasted like goat cheese ricotta and we had some in a salad and some in an omelet with sauteed vegetables. I would highly recommend this whole process. It brings out your inner chef.